As much as I love technology, I’m also aware that technology is one of humanity’s dirty little secrets. 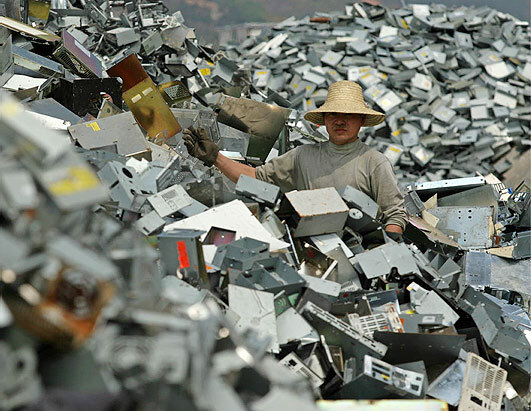 And yet, as the Story of Stuff so clearly illustrates, we’ve fallen so thoroughly for planned obsolescence, and the planned lifespan of electronic products, in particular, has been so drastically reduced, that e-waste is a very real global problem. Anyway, hats off to Dell, the focus of today’s Celebrating Eco-Progress installment, for their recent efforts to address the issue. Dell recycled more than 150 million pounds of electronics globally in fiscal year 2011, the computer giant said today. This puts the company about two-thirds of the way to its overarching goal of recycling one billion pounds of electronics waste (e-waste) by 2014. The FY 2011 figure was about 16 percent higher than the year before. The company credits its partnership with Goodwill Industries with helping it to make strides in the amount of end-of-life goods it recovers in North America, including used computers, monitors, printers, scanners and other pieces of equipment. The Dell Reconnect partnership helped Dell collect 95 million pounds of e-waste last year. I had some personal experience with Goodwill’s commitment to e-recycling about six months ago, when I donated an old iMac computer.. A week after I dropped it off, I had a mild panic attack, thinking I’d left some confidential personal information on the hard drive. So, I called and asked if they still had the computer, and whether or not I could come down there and check it out. Much to my surprise and relief, I was told that all computers are sent to an e-recycling center in Seattle, and that the hard drives are always wiped clean. I don’t know if Dell had anything to do with the recycling program at my local Goodwill, but it’s clear that these sustainable practices are taking hold. The company recently made headlines when it said it would begin shipping its servers in mushroom-based packaging instead of foam. Mushroom roots are added to cotton seed or wood fiber waste, where it digests the material to form cushions that can protect heavier electronics equipment. Dell said in late 2010 that it had reduced the energy consumption of its desktop and laptop computers by 25 percent, meeting a goal set two years ago. Again, we need to celebrate these efforts in a very public way, to let these HUGE companies know that we approve and are grateful and that we will be more likely to remain customers of theirs if they continue in this direction. yay a good news story. I feel like it is one step forward 10 steps back with the environment but this is definitely in the steps forward category. Yeah, Tom. I often feel the same way. But it’s all the more reason to go looking for the good things that happen and celebrate them from the rooftops. Thanks for all the supportive comments lately!